A new result from ESO’s HARPS planet finder shows that rocky planets not much bigger than Earth are very common in the habitable zones around faint red stars. The international team estimates that there are tens of billions of such planets in the Milky Way galaxy alone, and probably about one hundred in the Sun’s immediate neighbourhood. This is the first direct measurement of the frequency of super-Earths around red dwarfs, which account for 80% of the stars in the Milky Way. This first direct estimate of the number of light planets around red dwarf stars has just been announced by an international team using observations with the HARPS spectrograph on the 3.6-metre telescope at ESO’s La Silla Observatory in Chile . A recent announcement (eso1204), showing that planets are ubiquitous in our galaxy, used a different method that was not sensitive to the important class of exoplanets that lie in the habitable zones around red dwarfs. The HARPS team surveyed a carefully chosen sample of 102 red dwarf stars in the southern skies over a six-year period. A total of nine super-Earths (planets with masses between one and ten times that of Earth) were found, including two inside the habitable zones of Gliese 581 (eso0915) and Gliese 667 C respectively. The astronomers could estimate how heavy the planets were and how far from their stars they orbited. 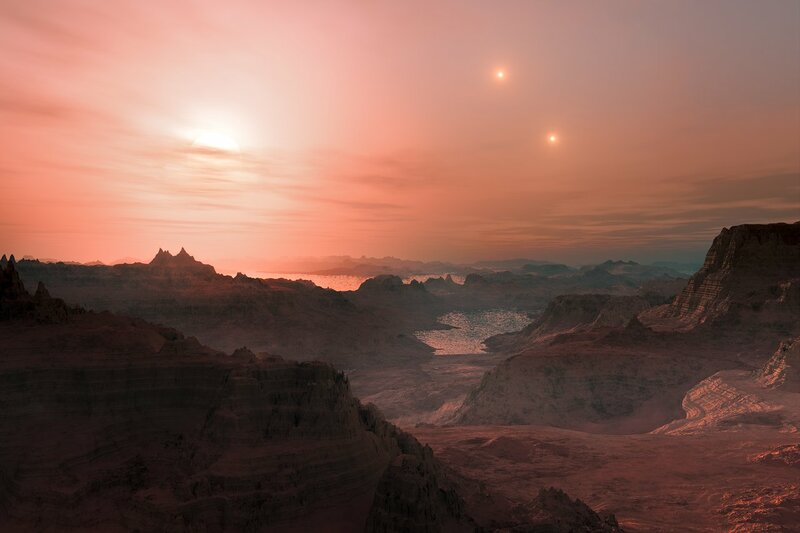 "The habitable zone around a red dwarf, where the temperature is suitable for liquid water to exist on the surface, is much closer to the star than the Earth is to the Sun," says Stéphane Udry (Geneva Observatory and member of the team). "But red dwarfs are known to be subject to stellar eruptions or flares, which may bathe the planet in X-rays or ultraviolet radiation, and which may make life there less likely." One of the planets discovered in the HARPS survey of red dwarfs is Gliese 667 Cc . This is the second planet in this triple star system (see eso0939 for the first) and seems to be situated close to the centre of the habitable zone. Although this planet is more than four times heavier than the Earth it is the closest twin to Earth found so far and almost certainly has the right conditions for the existence of liquid water on its surface. This is the second super-Earth planet inside the habitable zone of a red dwarf discovered during this HARPS survey, after Gliese 581d was announced in 2007 and confirmed in 2009. “Now that we know that there are many super-Earths around nearby red dwarfs we need to identify more of them using both HARPS and future instruments. Some of these planets are expected to pass in front of their parent star as they orbit — this will open up the exciting possibility of studying the planet’s atmosphere and searching for signs of life,” concludes Xavier Delfosse, another member of the team (eso1210). Please note that the original version of this press release incorrectly implied that the microlensing method was not sensitive to all planets around red dwarfs. This has now been corrected to say that it is not sensitive to planets in the habitable zones around red dwarfs. The team is composed of X. Bonfils (UJF-Grenoble 1 / CNRS-INSU, Institut de Planétologie et d’Astrophysique de Grenoble, France [IPAG]; Geneva Observatory, Switzerland), X. Delfosse (IPAG), S. Udry (Geneva Observatory), T. Forveille (IPAG), M. Mayor (Geneva Observatory), C. Perrier (IPAG), F. Bouchy (Institut d’Astrophysique de Paris, CNRS, France; Observatoire de Haute-Provence, France), M. Gillon (Université de Liège, Belgium; Geneva Observatory), C. Lovis (Geneva Observatory), F. Pepe (Geneva Observatory), D. Queloz (Geneva Observatory), N. C. Santos (Centro de Astrofísica da Universidade do Porto, Portugal), D. Ségransan (Geneva Observatory), J.-L. Bertaux (Service d’Aéronomie du CNRS, Verrières-le-Buisson, France), and Vasco Neves (Centro de Astrofísica da Universidade do Porto, Portugal and UJF-Grenoble 1 / CNRS-INSU, Institut de Planétologie et d’Astrophysique de Grenoble, France [IPAG]).